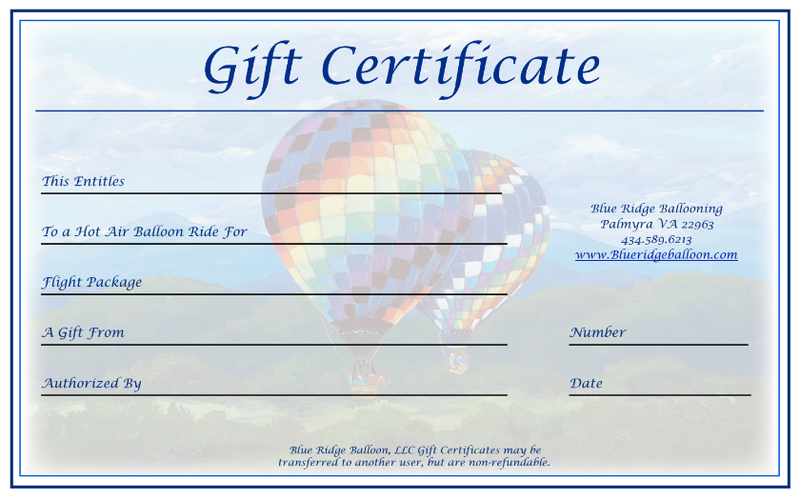 Blue Ridge Ballooning Gift Certificates are available for any flight package, or in incremental dollar amounts. They are accompanied by our attractive full-color brochure, as well as a personal letter to the recipient. To order yours today, just contact us. If you choose to purchase a gift card online, instead of receiving a printed copy, you will have the option of emailing the gift card and redemption code directly to the recipient. Gift certificates are issued without an expiration date, but we ask that they be used within one year. If certificates are redeemed more than a year after the date of purchase, any price difference (if applicable) will be due at flight time. Gift certificates are non refundable, and redemption is subject to the same medical and weight restrictions as all of our flight reservations. Gift certificates are fully transferable.